Announcement Orders ship within 1-4 business days from date of purchase. If you are interested in custom work/items, please feel free to send me a message. Orders ship within 1-4 business days from date of purchase. If you are interested in custom work/items, please feel free to send me a message. Classic Horror Babes sets sill available. Snag one before they are gone. Alien stickers galore. Sending out new orders! Get your valentine something far out and use coupon code STICKY for buy one get one $1.50 off (1/2 off)! I began my journey on Etsy in 2011. I started off making jewelry to help pay for minor expenses in while living at home with my parents. I had always been in interested in art and drawing since I could remember. I was always thinking of new things to make that I could sell to my friends. I decided to learn the ways of the masters and studied fine art in college. I graduated with a BFA in Drawing in 2014. My Etsy shop changed as I did. 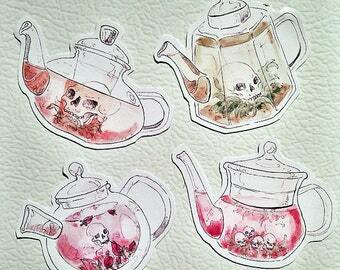 I started creating small prints and stickers that were all traditionally drawn by me. I was very inspired by Lisa Frank in my younger years and I see that coming out in my recent art ideas. I now work part time from my home studio making stickers completely by hand. I love staying creative and hope I can inspire others to follow their dreams and never give up. Creating is never a waste of time. Photos courtesy of a lovely friend, Madison Dopps. Independent traditional illustrator keeping the spirit of creating alive in the Pacific Northwest. I will gladly refund the total amount paid if an item is damaged, unless the buyer would like the item fixed. I am not responsible for items lost in the mail or items that have been shipped to the wrong address provided. I accept paypal payments, items will be shipped after receiving payment. Items are shipped Monday-Friday via the USPS. Any shipping upgrades such as over night shipping will be paid for by the buyer and only if the buyer has inquired before purchase. If an address error occurs, and you never get your item(s) in the mail due to incorrect address info, you (the buyer) are responsible. Custom orders take 2-3days to complete and then are shipped. Yes, please send me a message and we can discuss any custom orders! 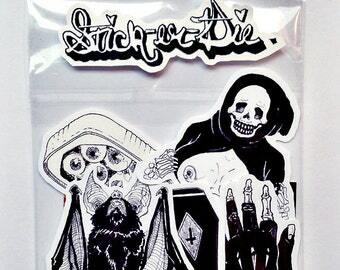 Your stickers are made with vinyl. They are recommended for indoor use, however they can get wet and not be ruined. Colors may bleed at first.